Do you need a date night, or just some quite time at home? 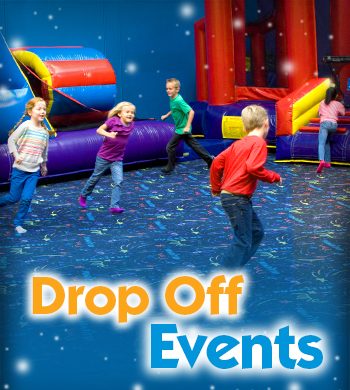 Drop your child/ren off at the Pump It Up in Trussville. We jump on our various inflatables. We have pizza, drinks, and a special dessert. Then we create and play games while our food settles. We finish off the evening by having a Glow party with music and dancing. When you come to pick them up, they will be tired, fed, and ready for bed. As always, socks and a signed waiver is needed in order to play. Does your child/ren attend Paine Elementary? Are you looking for a safe place for your child/ren to be until you get off work? Let them join us here at Pump It Up. We have our own school bus that we use to pick your child/ren up and safety bring them to our facility. We jump and play, have snack time, help with homework, special bubble and glow days, arts and crafts, etc. Your child/ren will be ready for supper, bath , and bed when you come to sign them out. Space is Limited and it is a first come, first serve basis. Call now for details 205-661-5557.